It was a difficult poetry book for him to write. And now, he will publicly read those poems aloud. "It's very, very personal," Jim Churchill-Dicks says of his book of poetry, "Wine-Dark Mother and the Trapper's Son," which was published in June 2016. "It's a book about passage, a complicated relationship, growing up, coming to grips with it, trying to find a mercy and a forgiveness that doesn't feel surface or trite but feels genuine from the roots on up." He will join three Bend authors at a book reading and signing event Monday, Feb. 19 beginning at 7 p.m. at the Volcanic Theatre Pub, 70 SW Century Drive, in Bend. "There will be four different readers, four very different literary tastes," Churchill-Dicks says of the event. "They're not just good writers, they're really good readers. There's a lot of entertainment value in it." 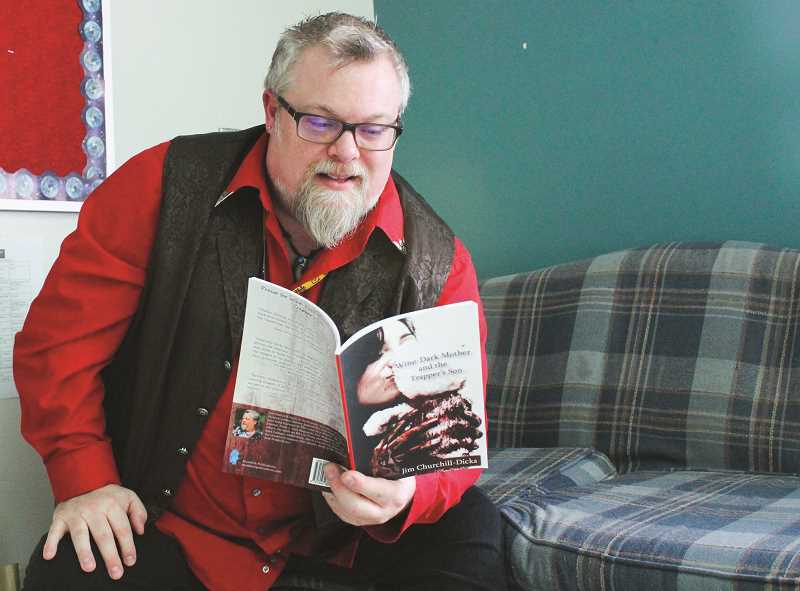 During the Book Launch and Celebration Monday evening, poet John Martin will read from his first published full-length poetry collection, "Hold This." It won the Louis Award from Concrete Wolf Press. Suzanne Burns writes both poetry and prose. She recently released her second short story collection, "The Veneration of Monsters," which was named one of the best books of 2017 by Kirkus Reviews. She also released "Boys," her new full-length poetry collection. Jamie Houghton is a poet, musician and teaching artist. Her poetry is featured online in various journals, and her chapbook, "Burn Site in Bloom," was released in 2017. Churchill-Dicks holds a Master of Fine Arts Degree in prose and poetry from Goddard College. He came to Crook County in 2001 from the Willamette Valley when he took a job at Mt. Bachelor Academy as an English teacher. Since 2007, he has taught language arts at Crook County High School. He is the founding editor of the Torches n' Pitchforks online literary journal, featuring the writings of local students. His individual works have been featured in The Good Men Project, The Other Journal, Press 1, Vain Magazine, Fire Magazine and others. Churchill-Dicks will read from his only published work, "Wine-Dark Mother and the Trapper's Son," a 67-page collection of poems by Musehick Publications. "It's basically a chronicle of a complicated family history that moves between trying to find mercy for the beautiful and complicated people in my family and also to stay out of harm's way in some ways," he said of the poetry. Writing about his experiences was a necessary journey to take. "There was a real sense of closure at the end. It felt like it was super important for me to write and to have outside of my body as opposed to inside," he said. "This is about coming to terms with how complicated we are as people. All of our families are complicated. We all have beautiful, complicated people in our lives." His mother, he explained, is the "wine-dark mother." "Wine-dark being part of the old Greek stories, especially in 'The Odyssey' when they use the term the wine-dark sea. The sea looks beautiful because of the sunset — there's beauty in it, but it's also dark because so much blood has been spilled," he said. "That reminded me a lot of my mom." His now estranged father is the trapper's son. "For a while, I thought I was the trapper's son and he was the trapper, but actually, my father was the trapper's son," he explained. "Seeing my father as the trapper's son created a great upwelling of compassion for him inside of me, which led to the more merciful final sequence of closure poems at the end." Churchill-Dicks has also written a poetry chapbook titled "The Language of Birds," which is nearly ready to publish, and a spoken word audio project titled "The Rodeo Clown's Lament," which he hopes to have completed by the end of 2018. He says if "Wine-Dark Mother and the Trapper's Son" was the past, "The Language of Birds" is very much the present. "'The Rodeo Clown's Lament,' I would say, is a result of me living here in Prineville since 2001, and although I've been very welcomed by everybody, I'm kind of the resident weirdo," he laughs. "I'm in love with this town. I'm in love with our people, and it's an interesting familial, which, because it's familial, it's a complicated love, but it's a love nonetheless." He hopes the locals will join him when he and other poets read from their works next Monday evening. "The Volcanic Theatre Pub is an amazing venue. It's a blast," he said, adding that they often host musicians and poets. "It's an all-ages place and a great deal of fun."